As we all know, setting aside only 15 minutes a day for creating is real nourishment for the soul. Not to mention that it will have a very good effect on your creativity if it becomes part of your daily routine. It’s pity that it doesn’t really work – not even for me, even though I use my brushes fairly often. Last year I made an attempt at painting every single day, and this year I did this one week long art challenge of repeat patterns again, coming up with super-exciting results. Last year I only painted whatever came to my mind, the point was to get myself painting every single day. This year, however, I took the task more seriously and found a topic for every day to paint patterns. I like painting in small size, which is great help especially if I need to cover a piece paper in patterns each day, so as usual, I was working in A6 size. I couldn’t spare the same amount of time every single day, sometimes I had less energy to create, which is visible on the outcome, but after all I did manage to squeeze in some painting time day after day. On the very first day of the challenge I didn’t worry about creating something very special: I painted red and blue stripes in my sketchbook. This was an important day because it was the first time for me to use my flat brush (see the pic), which I had about some 9 months before and never got round to try. I usually use round brushes and was a little suspicious with this one (I originally bought it for the illustration workshop) but for painting stripes it is the perfect tool. There are a lot of things you can think of when the topic is ‘sky’: stars, rockets, birds, anything that you might see if you look upwards. 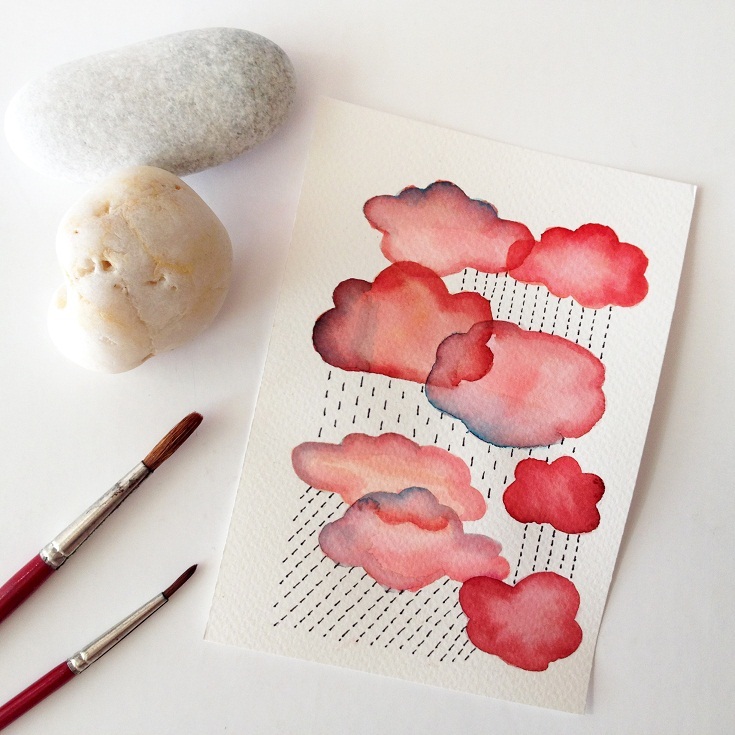 For me it was (red) rain clouds. It was around this time that I decided to theme this challenge red, which I more or less managed to keep up during the whole week. 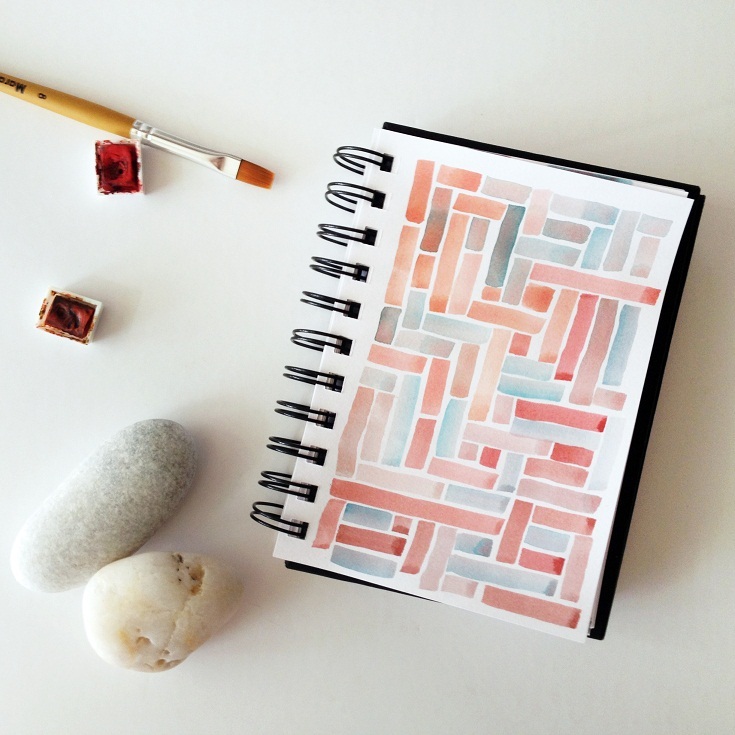 Currently I’m in love with the combination of red and pale blue. I wouldn’t really be me if I left out the ‘floral’ theme from this collection. 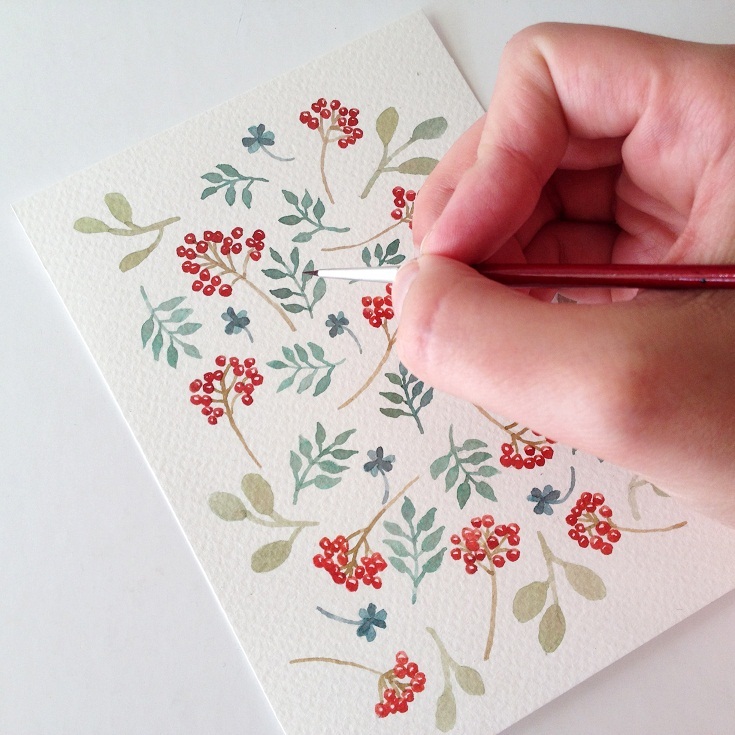 I had a little more time that day, so I was tinkering away merrily at all the little berries, leaves and cloves. It was a challenge to keep up the reddish tone of this image (a floral pattern should obviously have green overtones) but I turned the leaves into the blue-ish range, which managed to keep this little painting part of the series. Food illustration is something that has captured my imagination a lot recently (just check out my recipe coloumn), so I didn’t want to leave out this theme. 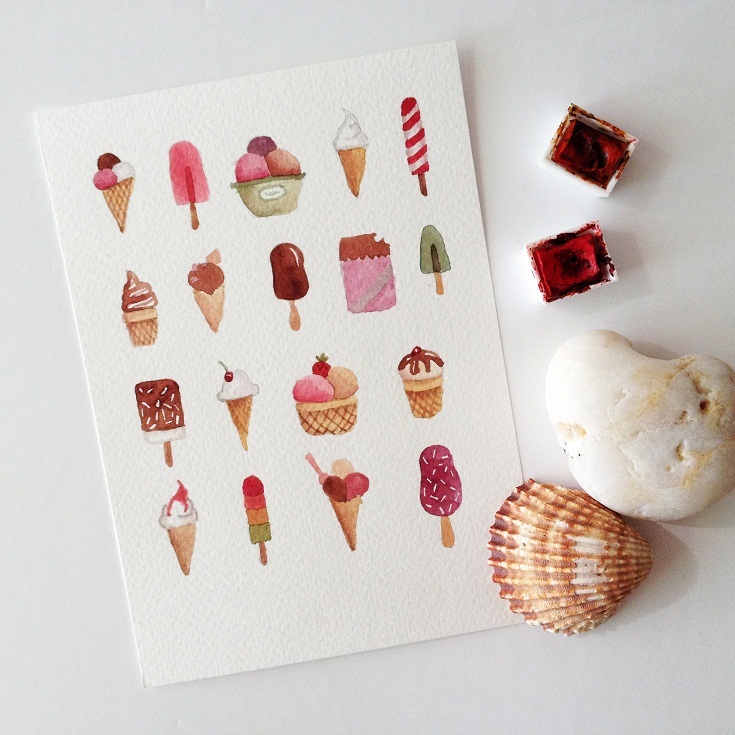 After all, you don’t have to muse too much to think of red coloured food in summer time, so I guess I could have filled even a larger piece of paper with these goodies. I was dawdling a lot over the previous days’ paintings, so I wanted to let my hair down a bit on the 5th day of this challenge. Painting small triangles didn’t seem like a big deal and I could play with the colours according to my liking. I am definitely a cat-lady, so the idea was to paint a bunch of these animals on the 7th day, but that morning I suddenly thought of the amazing and unique fur of wild animals: giraffes, panthers, tigers all wear repeating patterns. 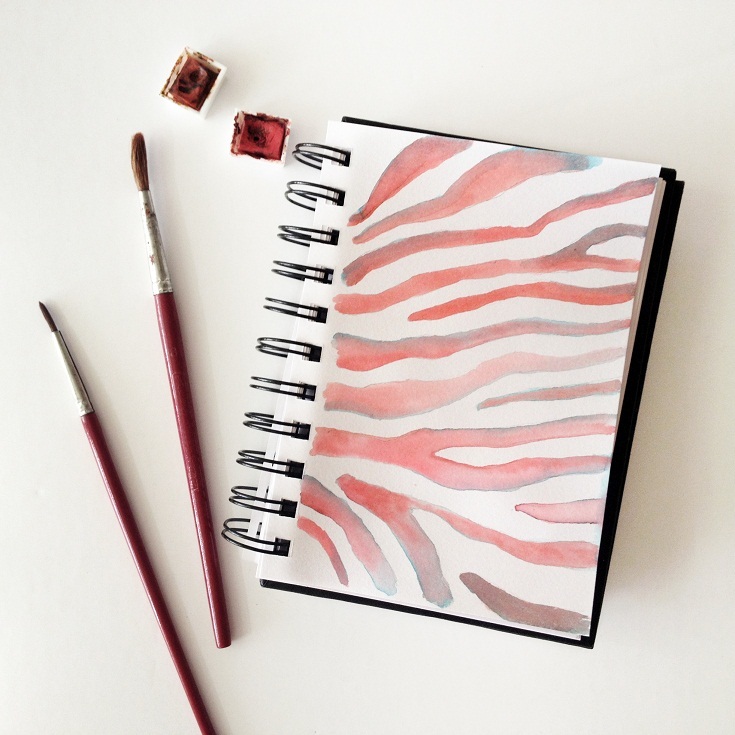 So you can see the side of a salmon coloured zebra in my sketchbook – also because it took so much less time to paint it than those lazy scratching-yawning kitties that I had initially been planning. During last year’s challenge I measured how much time I spent creating, so I could prove that you actually don’t need so much time to squeeze painting into your every-day life. This year, however, this didn’t work because for the first time in my life I recorded my working process on video. I had quite some stage-fright and my equipment needs a bit of improvement too, so I didn’t document my work every single day, but you can still get a glimpse into my painting process. If you like this video, please subscribe, I’ll try to come up with a new video soon. 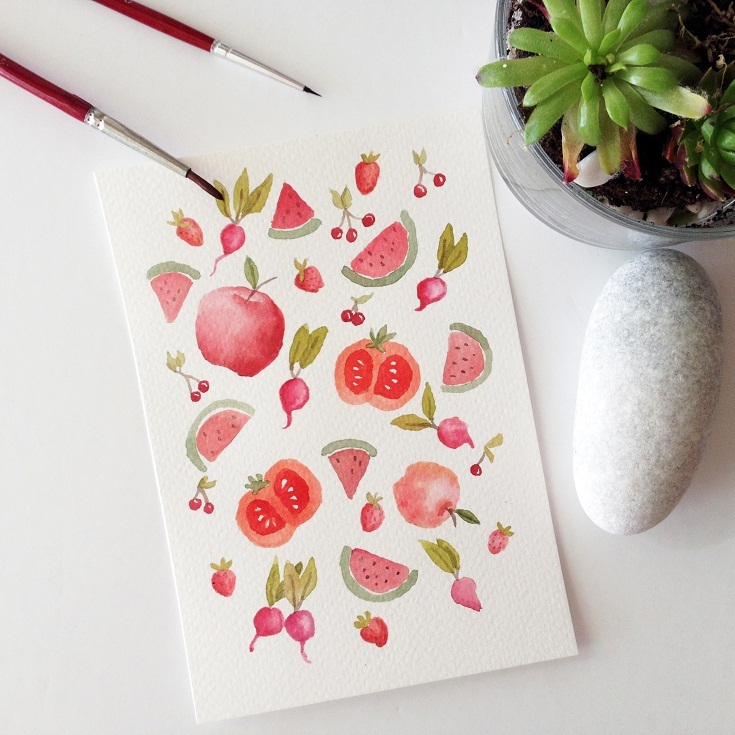 Painting repeating patterns is soothing to the nerves because you don’t have to produce new shapes and forms every minute, and offline time will help you develop your creativity. A one week long challenge is the perfect way to check if you can fit creating into your daily routine – believe me, you can! 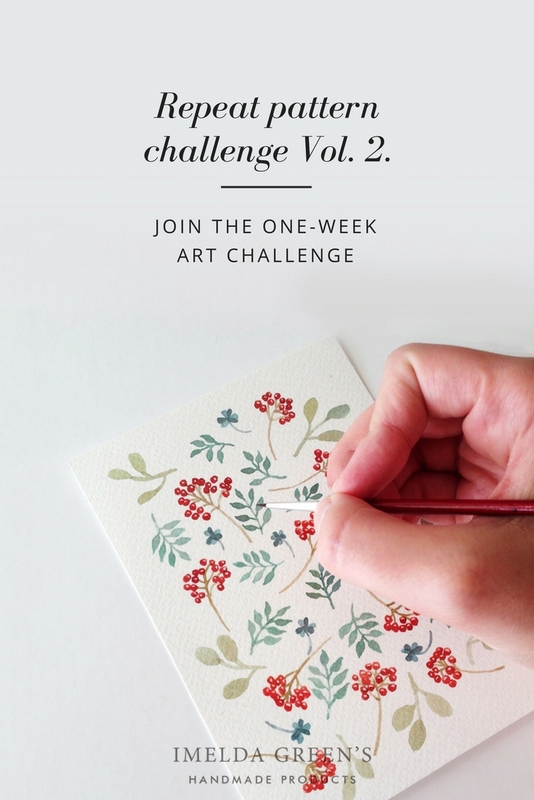 Join this challenge and for one week I’m going to send you a theme so you can start painting repeat patterns right away. There are no rules and no comparisons. Each and every piece you create is a unique artwork. Let’s paint together! Just what I needed! 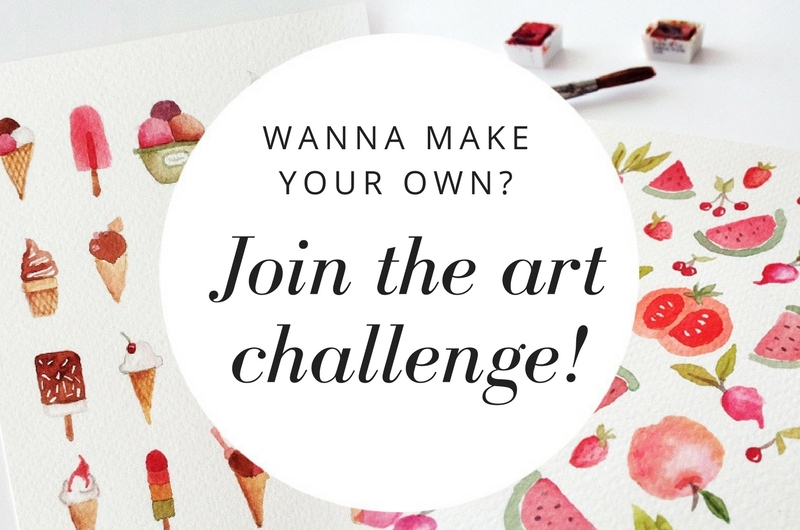 I finished 30 Days of Watercolour last week, so now I’m looking for something new to try :) I’ll join this challenge! Can I tag you on Instagram when I get around to it? Glad you are here. 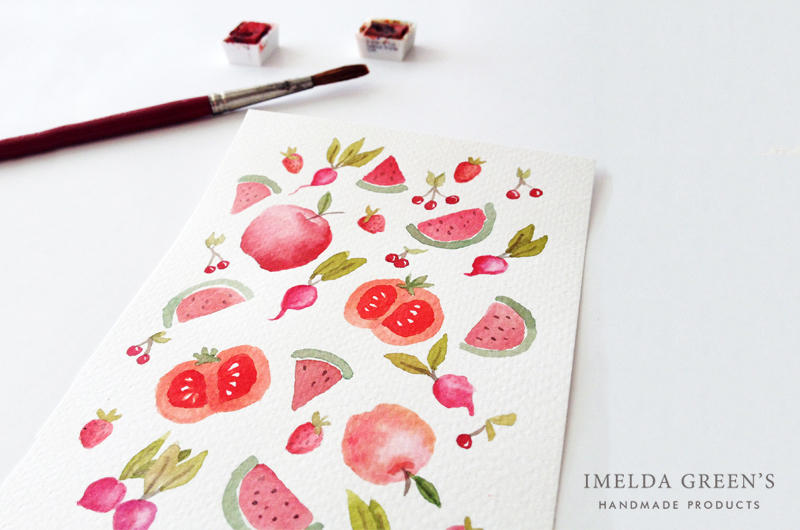 I am Imelda, a freelance illustrator and designer. 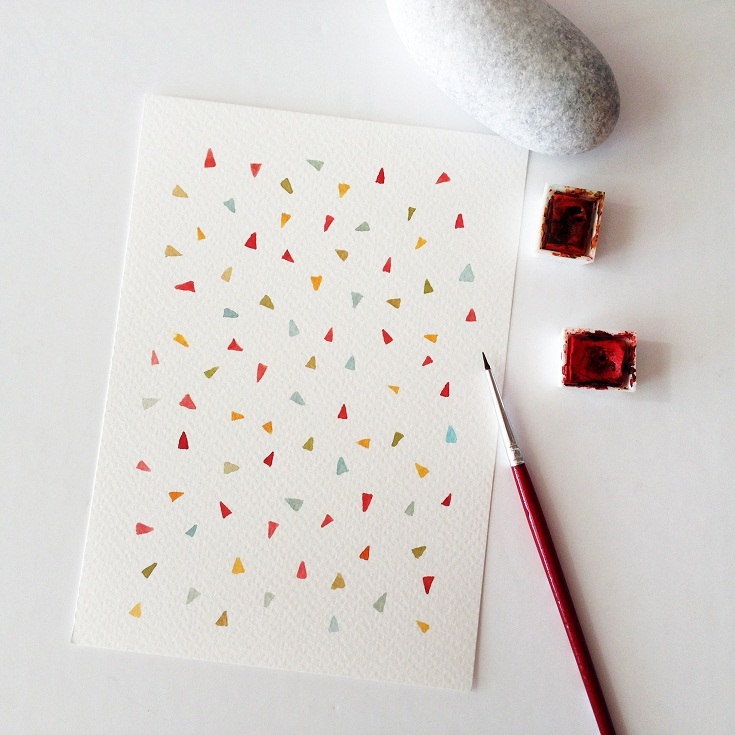 In this blog I share my works as well as inspiration and downloadable goodies. Enjoy yourself looking around.